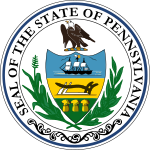 The 1976 United States presidential election in Pennsylvania took place on November 2, 1976, and was part of the 1976 United States presidential election. Voters chose 27 representatives, or electors to the Electoral College, who voted for president and vice president. Pennsylvania voted for the Democratic nominee, former Governor Jimmy Carter, over the Republican nominee, President Gerald Ford. Carter won Pennsylvania by a margin of 2.67 percentage points. While President Ford won more counties by running up victories in the central region of the state and the Philadelphia suburbs, Governor Carter swept Southwestern Pennsylvania where Pittsburgh is located, Erie County (Erie), Lackawanna County (Scranton), and Philadelphia. As of the 2016 presidential election[update], this is the last presidential election where the Democratic candidate won Pennsylvania without carrying any of Philadelphia’s suburban counties. ^ David Leip. 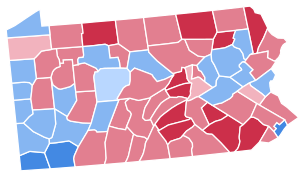 "1976 Presidential General Election Results – Pennsylvania". Dave Leip’s U.S. Election Atlas. Retrieved 2018-03-24.